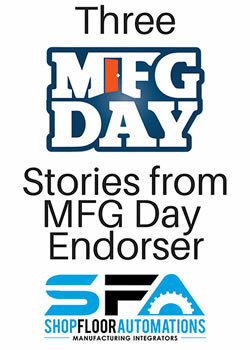 Shop Floor Automations (SFA), as an official endorser of MFG Day, shares stories of customers who are always looking for ways to close the manufacturing industry skills gap. Customer: FuelCell Energy in Torrington, Connecticut. Solution SFA provides: DNC Software as well as Ethernet RS23 hardware. Issue to address: The shop needed old Bridgeport CNC machines to communicate to a new PC. Point of View on MFG Day: “In all the companies I work with, their workforce is in their 50’s,” says Ross Bonacci, Tool & Die Marker. “In another ten years, they have no one there to continue the work, so it’s a great opportunity to get a trade…I see these kids leave college and they’re in Starbucks or retail, but I feel like manufacturing is really making a comeback. It’s a very satisfying career.” Fun fact: Ross works a second job as a CNC machinist course instructor at Henry Abbott Tech in Danbury, Connecticut! Neighbor: Rise Up Industries in Santee, California. Solution SFA provides: SFA was going to donate software or hardware for their operations, but we aren’t able to until they expand. We instead became a customer of theirs! How they are helping our industry: Rise Up is an 18-month long program providing reformed ex-prisoners with a gang-affiliated past with CNC machine operator training, life skills training, real-life exercises in work ethics, and additional forms of support. Point of view on expanding the MFG workforce: “We tell these guys, they know the stigma that they have attached,” says Machine Shop Manager/Instructor Dustin Greeves, who has been in the manufacturing industry for years. “I tell these guys that they train me as much as I train them.” Fun fact: Rise Up not only has a machine shop, but they also screen-print shirts (this is where SFA’s new shirts come from) and they sell their own brand of coffee in three different roasts! Customer: Fredon Corporation in Mentor, Ohio. Solution SFA provides: Floppy drive emulators and portable USB drip-feeding hardware. Issue to address: Bridging a technological skills gap for older machinery with a solution that can be universally used at his 70,000 square foot home office. Point of view on meeting collective technology challenges: “I had to find a quick and easy solution that could be utilized by all team members, regardless of technical ability,” says Randy Glover, Project Manager. “Very intuitive for some of our more seasoned machinists who are not super tech-savvy.” Fun fact: Randy has technology-related tattoos!